An open discussion to address the relationship of multiple–declared and undeclared–crises to the political, intellectual, and experiential project of feminism; or, more accurately, of feminisms–since they are plural, heterogeneous, and internally contested. How might we envision a feminist response to intersecting crises? Is there a crisis within “feminism” or among “feminisms”? 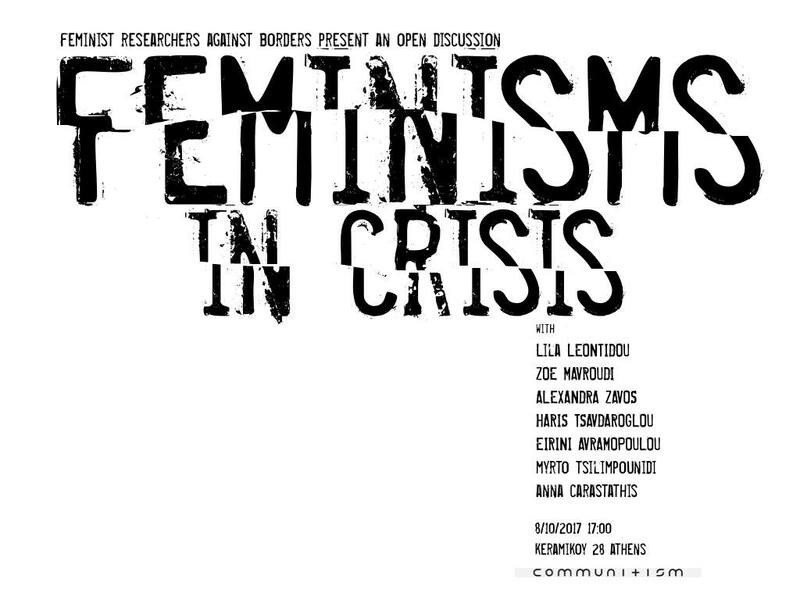 * Feminist Researchers Against Borders is a newly-formed network of feminist researchers, organisers, and activists working to dismantle the structures that coerce, constrain, criminalise, and control migration–including the borders of the nation-state and its management of human life through gender, sexuality, racialisation, citizenship, and colonialism. Through collaborative research and political interventions, we are in solidarity with struggles against the nation-state, borders, capitalism, and violence. The language of the meeting is English, with simultaneous whisper translation into/from Greek, Arabic, French, and Farsi. CRWI Diotima is a non for profit organization focused on women's issue and studies.